I came across this piece through a conversation with another collector. 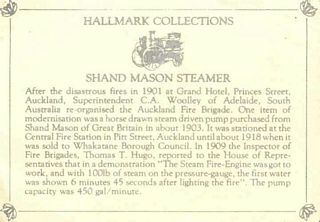 He mentioned he had seen a Matchbox Shand Mason Fire Engine in Auckland livery and I was quick to point out I was certain Lesney had never made one so it must be a rebuild. As it turned out we were both wrong - he in that the model was not a Matchbox and me in that the model was not a rebuild. 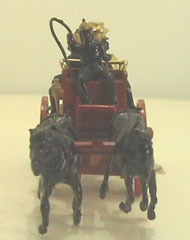 The model turned out to be a piece made by a company called Hallmark Collections (PO Box 40240, Auckland 10, New Zealand). 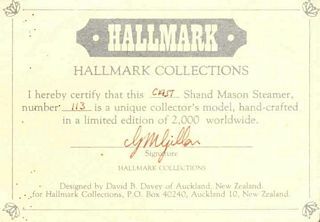 This brand name was new to me and although the item came without original packaging it was accompanied by a certificate proclaiming that "...number 113 is a unique collector's model, hand-crafted in a limited edition of 2,000 worldwide". This is an interesting piece and while the certificate states "Designed by David B. Davey of Auckland New Zealand", one could be forgiven for thinking it was a Lesney piece were it not for the size of the casting which appears to be slightly larger than I remember the Lesney piece (can't lay my hands on one as they are "buried" at present while home alterations are carried out). 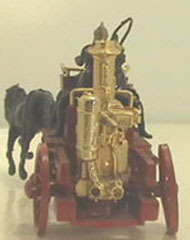 No scale is stated in the accompanying certificate but the item measures in at 99mm from the tip of the left hand side horse's nose to the rear of the carriage. 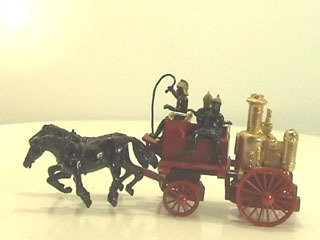 Each of the firemen is 20mm high (seated) so this would roughly set the piece at between 1:60 and 1:70 depending on how tall a seated figure you start with. I've assumed the average height of a man in 1900-1910 to be 5 foot six inches based on some historical data I was able to dredge up on the internet. A seated figure height of 4 feet 4 inches (I measured a 5 foot five inch adult sitting) gives a scale of 1:66 at least for the figures. Based on my limited knowledge of horses they also appear to scale out roughly to 1:66. Since pictures are better than words I hope they show up OK in terms of giving you an idea of the quality of the casting. It's not bad with sufficient detail for one to get the general idea. Unfortunately the horses are poorly fitted to the carriage and they don't have a realistic stance - in fact they won't stand properly at all with the left hand side horse wanting to tip forward all the time due to the fact only two of its legs will touch the ground! 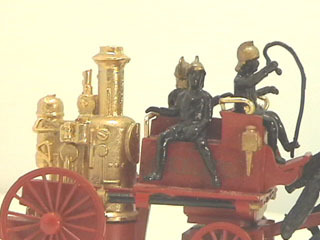 The colour scheme is, of course, red with gold "Auckland" lettering on the carriage (barely visible in the photo). The boiler is gold. Both horses and men are painted black (including the men's faces and hands, so it must have been one helluva fire they are returning from!) - the men's helmets are painted gold. 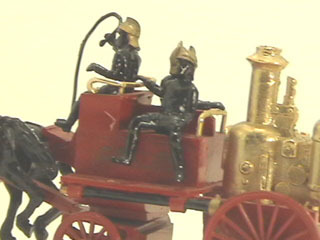 The hose on the side of the carriage is black with "brass" fittings.